So.. the craft fair is coming up next Saturday and I decided, since I have the time, to make some jewelry displays to show off my new pieces. 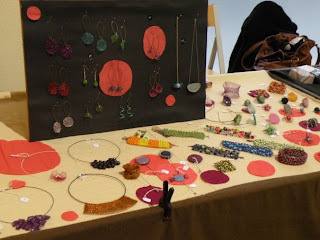 Mitsy, from ArtMind, published this awesome tutorial about price tags and I love her display for the necklaces and the earrings, so I'm going to make one like hers to put my earrings. I used the one in the picture below before, but now I think I need something lighter and more "clean" and Mitsy's display seems perfect. But I need something to show off my rings and necklaces. Do you have any ideas? Planeei fazer o expositor que a Mitsy publicou no seu blog, para colocar os meus brincos para a feira da próxima semana. O que usava dantes podem ver na fotografia em cima. Ana, I am still struggling myself with the rings and necklaces. But I remember that dinafragola had great necklace busts made herself. Or I woulkd find some branchy driftwood and make that into a display. Glad you loved my display, Nanouke and I agree that something lighter makes your table lighten up. For my rings, I just used a wooden crate and displayed them on there.. They burst of colors so that attracted people to look. For earrings, I saw yesterday on a fair that someone had use a picture frame and added wire to the back and the you could hang the earrings in the wire. It looke handy. check at Tina's blog, you may find a cool idea..